Attention, all makeup lovers! Kiko Milano recently launched their Spring 2.0 Collection and we are going gaga over it. Let’s talk about Kiko Milano’s Spring 2.0 Collection in detail, what we like (or what we don’t! ), why you should buy these (or why you shouldn’t!). And stay tuned because, at the end of this post, we will also be sharing 105K Instagram Giveaway with Kiko Milano where we are giving 4 of their makeup products away to 2 lucky winners. If you haven’t already seen their latest collection, this is what the collection looks like! First, let’s start with my absolute favorite, which is this Multi Color Glitter Eyeliner! 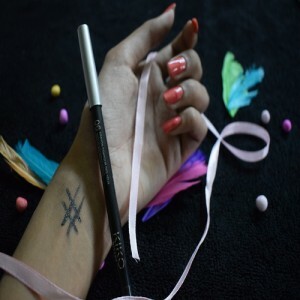 I have received this Eyeliner in the shade 06 – Luminous Black. Abroad, this is available in 5 other shades as well, that is, 01 Diaphanous Gold, 02 Silent Taupe, 03 Atmospheric Mocha, 04 Lagoon Turquoise, 05 Celestial Steel. This product is priced at Rs. 920 and has 0.5g worth of product. The application is simple and adjustable for all kinds of lines, from thin to thick which makes it easy to use, even for beginners. The deep color glides on without a problem. The product with pure pigments is blendable immediately after application. Silky soft to the touch, the product creates a precise line that’s even and long lasting. For me, the eyeliner stayed up the whole day while I was shooting without any retouch(1-9pm). You can see the look I created with this eyeliner (no-makeup makeup look) in my latest YouTube video. The makeup looked subtle and a single stroke did the trick! The glitter occasionally shines which creates a sense of mystery as well! Hope you enjoy the video! Do give it a thumbs up if you like it. 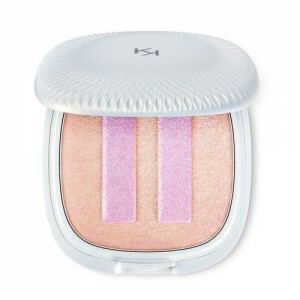 I have also used a hint of Kiko Milano’s Natural Color Blush in the video. 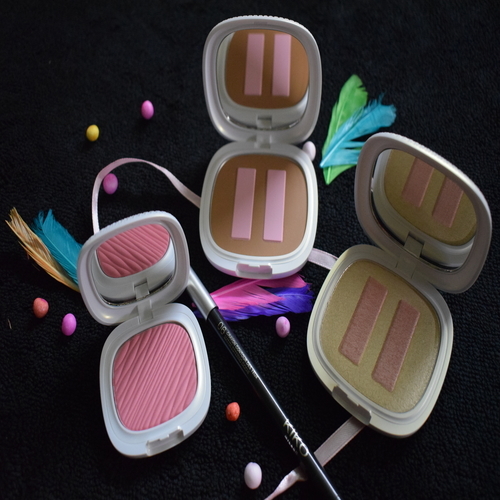 The Blush is available in three shades, that is, 01 Brilliant Sunrise, 02 Breathtaking Azalea (the one I own) and 03 Sunset Pomegranate. I absolutely love the shade 02 as it looks perfect on my skin! It is priced at Rs. 1500 for 5g product. 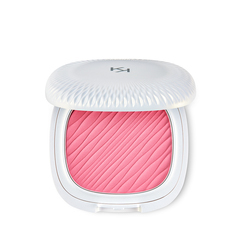 It has a very fine, velvety texture which ensures that the color applies perfectly and blends instantly. The powder clings to the skin, creating a natural, smooth finish. In no way does it look overdone or cakey. The product is also Dermatologically tested and Non-comedogenic (in simpler words, denoting a cosmetic that is formulated so as not to cause blocked pores) which makes it perfect for sensitive, oily and even acne-prone skin! Being a girl who ends up with breakouts quite easily, this product is a Godsend! Another product from this range which has been becoming one of my shoot staples is the Natural Color Highlighter from this range! It’s priced at Rs. 1850 and is a 9g product. It is available in two shades, that is, 01 Iridescent Rose and 02 Iridescent Champagne (the one I own). “A concealer with additional highlighting properties has been incorporated into the center of the highlighter and fashioned in the shape of the “pause” symbol. Blending the two different textures creates a lightweight, natural effect that adds light while concealing imperfections,” claims Kiko Milano. This well-researched product provides high-definition make-up that brushes on smoothly and easily. I think that adding the concealer part was very smart as a lot of highlighters end up enhancing pores. This pause sign can help blend as well as conceal any imperfections. The highlighter stays for about 2-3 hours before it needs a retouch. The product is also Dermatologically tested and Non-comedogenic (in simpler words, denoting a cosmetic that is formulated so as not to cause blocked pores) which makes it perfect for sensitive, oily and even acne-prone skin! Being a girl who ends up with breakouts quite easily, this product is a Godsend! The last product that I’m not the biggest fan of in this range is Kiko Milano’s Natural Color Bronzer. It is priced at Rs. 1850 for 12g worth of product. It is available in 4 shades: 01 Empowering Honey, 02 Harmonic Sienna, 03 Recharging Honey and 04 Naturalistic Sienna (the one I own). Now while I love the concealer shaped as a pause, the product does not give full coverage as it claims and it does take time to blend, unlike the other products in this range. The product did not add any special element to my makeup that would make it my staple and thus ended up with my extra makeup products. However, for anyone who might like this product, you’re in luck because this product is also Dermatologically tested and Non-comedogenic. Enjoy the tutorial. Do comment if you’d like to see more tutorials on my channel! And now let’s talk about the most awaited 105K Giveaway with Kiko Milano part of this blog! That’s it for today, more such posts are soon to follow, so make sure you subscribe to our website! If you want to share your own reviews and views with us, whether good or bad, feel free to connect with us at aashnamalanii@gmail.com! If you’d like to join us as an intern, please read this, fill the details and get in touch. The review is our personal opinion. We reserve all rights to the giveaway and our selection will be final. Loved the review. Need that liner in my life! Will try that!! Hope to win this time. Do check Rule 2 (https://www.instagram.com/p/BSK5vPvgkTt/?taken-by=aashnamalanii) in the giveaway post! Without that your entry will not be counted. Thanks Aashna for conducting this giveaway…. Nd giving us an chance to win….these products…. Do read this blog post properly to check the 4 products the 2 winners can win. (It’s all mentioned at the end along with pictures). You only have to choose 2 from them. The Spring 2.0 Collection is not part of the giveaway. I want to own….the kiko milano’s glitter eye liner not because this stuffs are costly…. Nd not widely available in my city….bt jst bcoz ….i have got a really really beautiful pair of eyes….which is appreciated by all….so i lovd to have eye make up very much…..so this is the reason i want to own this eyeliner….. I loved the collection but I loved the most is the natural color highlighter. And yes my fav thing is the wet dry eye shadow I love dark smokey shades. I am like obsessed. Eye shadow to me is like cherry on cake. To give a perfect look and complete my fav thing is. Liner and an eye shadow I dnt step out for a party with this wish to win win win plz this time ???? Didi i really want to own…the…kiko milano…eye liner….not bcoz they are costly nd not available in our city…..i want to own it jst bcoz..i am having a really beautiful pair of green eyes…which is loved by everyone… So m a huge eye makeup lover……that’s y i want to own….this glitter….eye liner…nd thanks didi for giving us this chance to win these giveaway…. I hope that this tym i get the chance to be one of the winner….thanks didi…. Love you???????? Amazing collection like always. I want eye shadow and lipstick. I love aashna malani and kiko milano makeup???? I love the bronzer and the highlighter mam my email id is Yashmitasharma10@gmail.com hope to win this time mam ???? Lovely reveiw my 2 favourite product is that. 1. Creamy lipstick. Hey hi aashna ???? love this review and I would like to win Kiko High pigment wet & dry eyeshadow, creamy lipstick. And my em di – @angelsweete381@ . And my instagram I’d lenaass_is_cute. Following you since a long time and Kiko on instagram as well Thanks for this opportunity ???????? How to subscribe to your blog? I’ve been following you lately and I must say you’re so gorgeous! I would love to try the lipstick and the high pigment eyeshadow. Looking forward to more awesome videos and reviews from you. I would love to win the creamy lipstick and the high pigment wet and dry eyeshadow. If i had to choose from the above products than i would like to go for the lipstick and the eye-shadow…. love u so much Aashna.. been following you for 1 year now.. hope I get lucky.. I would like to win nailpolish and high pigment eyeshadow.. any color of your choice <3 love u so so much.. nd my email is nailinisharmamua@ plz check..
Would love to win the Kiko Milano Wet and Dry eyeshadow in the shade 37 and the creamy lipstick.. I have their wet and dry eyeshadow in the shade charcoal grey and ever since then I am obsessed with them these are one of the best pigmented eyeshadows. Super blendable ???????? Hey I have mailed ypu about the internship….still waiting for reply ??? ?